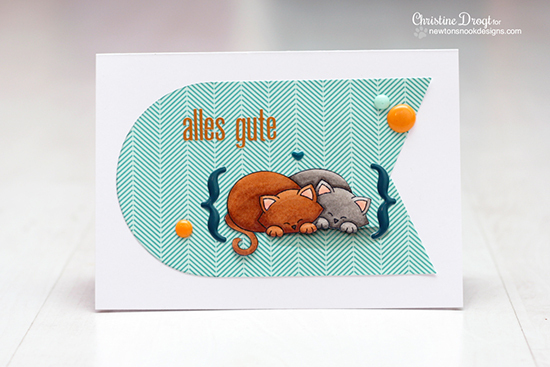 I really love the bright colors and simple layout on this card by Design Team Member, Christine Drogt! She used the two snuggly kitties image from our Newton's Antics set and colored them so perfectly (did you notice the little shadow?) I love the color combo and big brackets around the kitties. So fun! Her sentiment is in German - I think it means "all the best" or something close to that. To find out more, head over to Christine's blog, Kartenchaos and see what else she's created lately! Inky Paws Challenge #8 starts tomorrow! adorable card by Christine, I love the DP! This is darling! Just love those kitties! eek! i just think this card is the cat's meow!!! i LOOOOOOVE it!! the colors, the sentiment and the cats!! and that shadow - i totally missed it at first! but it's so cool!! !